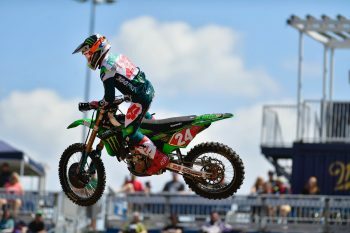 Austin Forkner’s bid for the 250SX East crown in the 2019 Monster Energy AMA Supecross Championship is in doubt after sustaining a suspected knee injury during practice at Nashville’s round on Saturday night. The Pro Circuit Monster Energy Kawasaki rider held an extensive points lead coming into the weekend, however it all unravelled in practice when the youthful talent crashed heavily coming out of the whoop section. He returned to the circuit for the final practice session, where the injury worsened, prompting him to sit out the night’s proceedings. He will now undergo further medical evaluation this week. 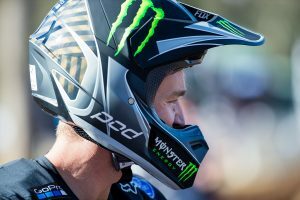 “Well not how I wanted that to go,” Forkner said in a statement. 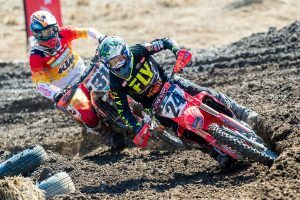 “As some of you probably know I got sketchy in the whoops and stuck my leg out and did something to my knee in second practice. Despite missing the night show, Forker holds a three-point lead in the championship standings over Chase Sexton (Geico Honda).